One night, I had a dream.... an EPIC one. Expression was everything.... it was me, virtually. No avatar, just a an ubiquitous e-me.... with friends crusin' an earth blue as an orange. 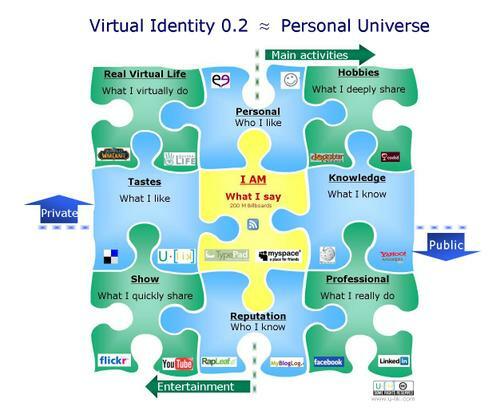 Could have called it Identity 2.0 but I am rather binary and we're on the way, still nesting our identities. So I breathe and believe. It's been two years since we start thinking about U. [lik] and we are know ready to be part of the identity puzzle. With our main extra feature : recommendation with affinity; so it will not be just popularity rulin' but attention. ... it's been a really pleasant trip... I believe it still will be ! Pour le Français voir l'identité virtuelle chez Fred Cavazza! Even if i fear holistic representation of the world (to stick ideas on lines is the best way to stop thinking ;-), i have to confess this one looks good. Would it be possible to introduce the concept of the 2 brain hemispheres ? I suppose emotional and rational approches would enrich the map cause they are based on level of implication, of production, of needs, of awareness quite different. Suggestions on the two sides are not expected on the same way : for instance, when i am looking forward relevance on professionnal subjects (rational side), i want the objective right suggestion / when, i am looking for a new dvd location (emmotionnal side), surprise could be welcomed... quite different no ? I am a very big fan of your diagram. It's funny because our personal relevancy engine is called 'I-AM'. It would be great to get in touch - drop me a line via email if you're interested in working together somehow! leafar: Je te rejoins tout à fait sandrine.